When trying to understand what qualifies as a ghetto tattoo, you need to know what a ghetto is. The word "ghetto" is described in relation to North American urban communities. Usually these are thickly populated with underprivileged, impoverished people of an ethnic or minority group subjected to racial discrimination, economic pressures, and financial adversity. The harsh circumstances of ghettos are known to produce cliques, groups, and gangs that individuals may affiliate with in order to gain a stronger sense of personal identity, membership in a tougher crowd, and financial benefits. People directly involved within these groups or those who are surrounded by them have created ghetto tattoos, using their skin as a journal to express what ghetto life entails through symbolic imagery and commemorative writing. As with all tattoos, the possibilities and uniqueness for ghetto tattoos are endless. However, the following tattoos appear most often and are recommended when in search of ghetto-styled needlework. This is a symbolic tattoo often used to represent a murdered individual. Speculation as to who the wearer of this tattoo is in relation to the deceased individual exists. Some believe that the wearer (especially if he or she is a prison inmate) of a teardrop tattoo is the killer, while each tear counts for a victim. The other trend is for family members to wear the teardrop in memory of a loved one, revealing that they have lost this person through murder. This tattoo is placed underneath the eye, in plain sight to visually cry out to anyone within sight. Many people choose to have their surname tattooed across their upper back. This can be done in Old English font or a variety or cursive fonts. Usually they create the look with a dark ink. Tattoos of this kind pay a tribute to family lineage. 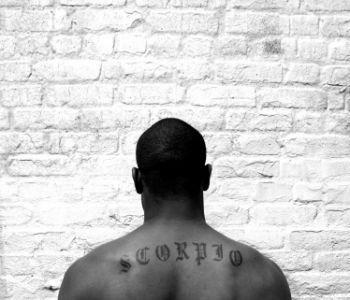 In addition, they use a simple phrase or even zodiac signs across the upper back as a bold expression of self. Associated with authority and leadership, a crown is sometimes tattooed onto the face of prison inmates who have taken up a highly respected position while serving time. Images associated with money and finances are used for ghetto tattoo art. Dollar signs, money purses, coins, dollar faces, and dollar bills are just a few of the financial instruments chosen for this type of tattoo. A pit bull tattoo is to express power and solicit fear within gangs. Often associated with ferociousness and anger, the pit bull depicts rage and roughness. While the dog may appear tame, it can unsuspectingly attack and destroy the weak. In Latino culture, three dots (usually in black ink) placed in a triangular formation represent the cultural heritage in ghetto society. The image signifies the phrase "mi vida loca," or "my crazy life." It is usually found on the hand between the thumb and forefinger. 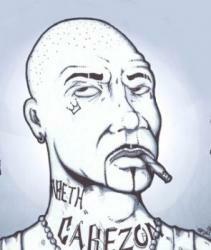 The image of the comedy and tragedy masks is a very common one in ghetto tattoo art. The phrase, "laugh now, cry later," is associated and sometimes directly tattooed along with the masks. This tattoo expresses the belief that people should enjoy life in the present since the future holds untold pains and trials that will soon unfold. A spider web on the neck or elbow indicates that the wearer had served time in jail or prison. The idea behind this design relates to a spider web that captivates and entangles its victims, similar to the wearer who has undergone a comparable experience of imprisonment. Although they may have originated within particular areas of economic hardship and strife, ghetto tattoos are now a popular style. Obtaining a ghetto tattoo does not necessitate that the individual belongs to the ghetto community; rather, the theme is now considered a fashionable look for adorning one's skin. Similar to traditional American tattoos that have become a widely accepted style throughout the United States (while having its roots originated within the U.S. Navy during the first and second World Wars), ghetto tattoos have received a level of fame, distinction, and are sought-after more and more over time.